You don’t ask much from the season; you’re happy with iconic burgers reinterpreted, some perfectly ripe cherries, a little sun, and hundreds of wines. Welcome to your perfect summer food week. You could say that Chef Andre Guerrero’s specialty is taking a great thing and making it better: fast food, Italian fare, beer. This week? Burger Week redux. 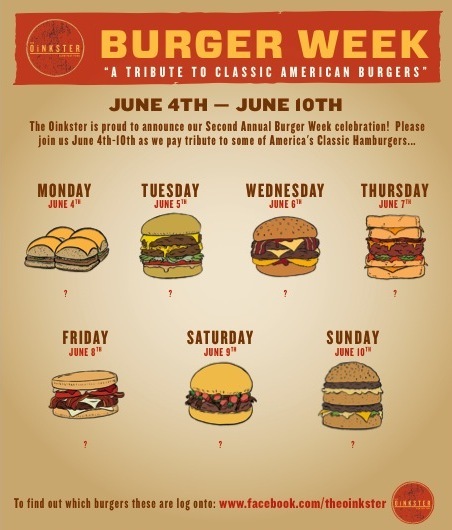 Starting today, June 4th, Guerrero kicks off The Second Annual Oinkster Burger Week at his “slow fast food” joint in Eagle Rock. Each day, Guerrero will revamp a classic burger starting with Monday’s Red Castle Sliders and ending on Sunday, June 10th with The Big Max. Collect a pin for each burger bought; consumers of all seven burgers with receipts to prove it (No exceptions, slackers!) get first-come, first clothed, white-on-black t-shirts; designer Melanie Freeland and team are up for a Restaurant Design Award so it’s something you’d actually be proud to wear. Also available: a commemorative poster and the Pig Candy zine with burger-inspired art by the likes of Paul Frank, Sage Vaughn, and Hot Knives. Hot Knives and a cold beer: always your preferred burger accoutrements. You love the idea of picking your own summer bounty but fava beans are so Hannibal Lecter-ish and strawberries would be swell if only they’d levitate into your hand. Enter cherries: the perfect, pickable fruit. The oh-so-short cherry-picking season starts today at one of Ms Go Go’s fave, pick-your-own fruit farms: Villa del Sol in the Leona Valley near Palmdale. 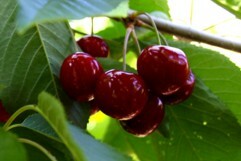 Organic Brooks cherries can be plucked starting today, June 4th; Bings and Rainiers are available June 9th. Just in case you want to vary your cherries. Fingers crossed, the season will continue through July 4th — you love a cherry pie with your cherry bombs — but before you head to the farm, which also sells raw, unpasteurized honey straight from the comb,Villa del Sol owners Gary and Maxi advise checking the website or calling the Cherry Hotline (661 270-1356). A cherry with a hotline: an idea whose time has come. U-PICK CHERRIES — June 4 – July 4th; Mon-Fri, 8am – 5pm/Sat-Sun, 8am – 3pm; all ages/NO DOGS/$5 minimum purchase — Villa del Sol Sweet Cherry Farms, 6989 Elizabeth Lake Rd, Leona Valley, 93551, 661.270.1356 or email info@upickcherries.com. Bet you can’t drink just one…. Winemaker, Winemaker, Pour Me A Glass. You’ll admit to a certain tendency toward excess. But even you might be a bit intimidated by the The 7th Annual LA WineFest. Or as Ms. Go Go likes to call it: 500 wines and you. 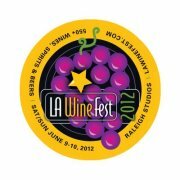 In addition to domestic wines, including California gold medal winners such as Armida, Eberle and Michael David wineries, the June 9th and 10th vino mega-fest at the historic Raleigh Studios in Hollywood will feature international wines including pours from Korea, Slovenia, and Israel. They pretty much had you at Slovenia. The event will also feature beer and spirit purveyors, including Firestone Walker, Pisco Porton from Peru, and Charmsoon Soju from Korea, and (additional cost) “lifestyle” events such as an artisanal wine and cheese seminars, a winemakers panel, and Scotch and tequila tastings. Expect live music and food trucks with funds supporting City of Hope. Determined to live large and drink larger? You can try to sweet-talk a pal into coming along as a designated driver for a significantly reduced admittance fee. BONUS TIP!!!! Summer cocktails under the stars at the LA Cocktail Classic? Yes, please. Big thanks and yes, stay tuned for more of Ms. Go Go’s picks for summer food and fun!